Faye has lead presenting on our Enterprise Challenge-Days in the UK as well as Tanzania. Faye’s background lies in two distinct fields of expertise: Actuarial Science and Conservation and Biodiversity research. Faye graduated with first honours in Actuarial Science in London and thereafter, held a position working as a life insurance consultant, developing skills in statistical modelling and financial reporting. Faye’s passion for wildlife and the natural world outside of London overtook though and she was soon selected to lead a biodiversity research project in South Africa, living there for over a year. Faye continued to follow this route and has completed an MSc in Conservation and Biodiversity from the University of Exeter. She has since gone on to work in the UK, mainland Europe, Uganda and Borneo as a research scientist and has attained her Doctorate in Conservation and Biodiversity. 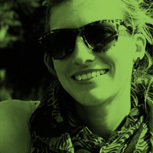 Faye has worked on the development and operations our programmes in the UK and Tanzania.